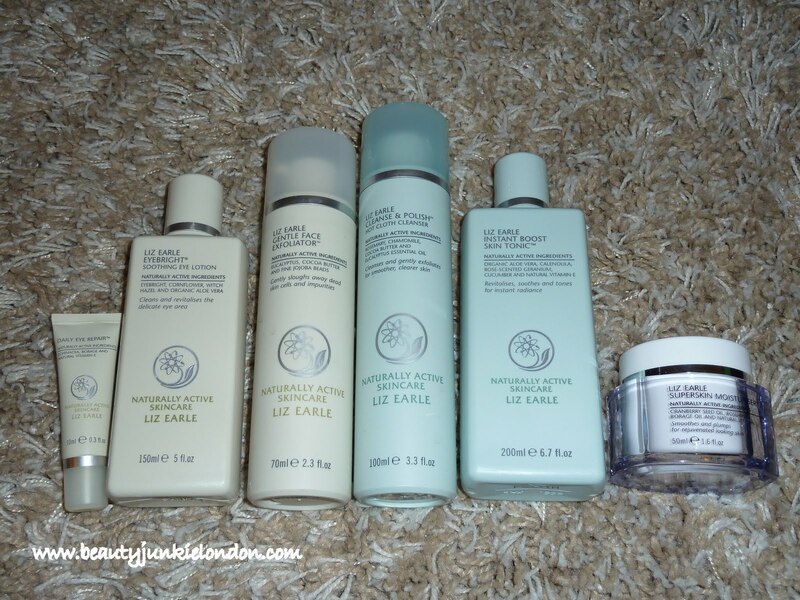 I was sent a few bits from the Liz Earle range months ago, and it has taken me far too long to get round to giving them a proper test. This is mostly because I am a little reluctant to change my skin care routine too much as there is nothing more confidence-destroying than having bad skin – and changing what I am using too much can really upset my skin. But better late than never, I have now gotten around to giving the Liz Earle bits a proper try and here are my views. Undoubtedly the iconic product of the range, this is one I have actually tried before a few years ago. A thick cleansing cream is massaged into skin and then ‘buffed’ off with a muslin cloth – to provide a delicate exfoliation and cleanse that isn’t drying. Second time around using this and it’s very much the same – it is a good cleanser although I do still find I want to do a double cleanse (start with a cleansing oil – currently using MAC’s Cleanse Off Oil) to get my skin truly clean. I love the smell of this product, the eucalyptus is really refreshing – it’s great as a wake up call in the morning. This feels very similar in texture to the cleanse and polish – it’s quite thick, but with fine exfoliating granules. This is one of the products I would happily buy again. I have been told over and over that toner is pretty much a non-essential part of a skin care routine, but it’s a part that I really like. I find toners really refreshing and help to remove and left over residue from the cleanse, this is especially the case when I use a thick cleanser such as cleanse and polish. Toners can be very drying as they often contain alcohol to create the refreshing feeling, but this doesn’t do much for most skin types – this is the opposite, it almost feels moisturising. It’s lovely! This is another product I had a few years ago and it lasted ages (well beyond running out of the cleanse and polish) again, one I would buy again. Another nice product, but not one I would buy – it’s pleasant to use and refreshing but I can’t help but feel it’s a little pointless/excessive. As the Instant Boost is so gentle I would be happy to use (and have been) it close to the delicate eye area rather than buy another product. Perhaps if you have more sensitive eyes than me then this might be one that will be vital for you? I have to be honest, I didn’t use this for very long – I tried it twice and just couldn’t get along with it. It’s too heavy for my skin and personally, I found the smell hard to put up with. It’s amazing the difference a smell of a product can make to someones impression of it – for me, it’s something I definitely put high up on my review criteria (for all products – not just skin care). Just my personal view, but this isn’t one for me. This is an eye repair cream that also states it can be used around the eyes, mouth and forehead. It does contain light reflecting particles so only really suitable for day time the texture is light and absorbs quickly without leaving any residue – so doesn’t create any issues with applying make-up over it. I need to become more disciplined at using eye creams, especially as fine lines around my eye area are my biggest skin concern (for today at least…) so this is a good start. So overall, there are some products I like, some that I’m a bit indifferent about and one that I really dislike. Of course as always, this is just my view and everyone will feel differently – but I am glad I had the chance to try them again, especially as it has helped me rediscover the cleanse and polish and instant boost. I guess the lesson to learn from this is that usually with skin care it’s best to go for a mix and match approach to find what works for you. Don’t assume it’s always best to use EVERYTHING from one brand – picking and choosing the best bits for you from a few brands is likely to deliver better results. These products were provided for review as PR samples. i agree with the points you made about scent & mixing skincare products. with regards to scent, it’s really not something you can ignore, can you? it’s SO important for it to be pleasing to the user. and with regards to matching skincare products, the only time i’ve ever had success doing that was with clinique’s 3 step system and that only worked for maybe a year. mixing products truly is the best, that way you can tailor it specifically to your needs. great review, can’t wait to try some of these products! specifically the cleanse & polish. I also use pre-cleanse by dermalogica and change between various moisturisers, so yes I would agree that, although the beauty companies would try to tell you otherwise, you don’t need to use an entire range to enjoy the benefits.